Petra and Wadi Rum tours from Aqaba port will take you back to the magical time of Jordan. You will be picked up from Aqaba port by the cruise exit door. 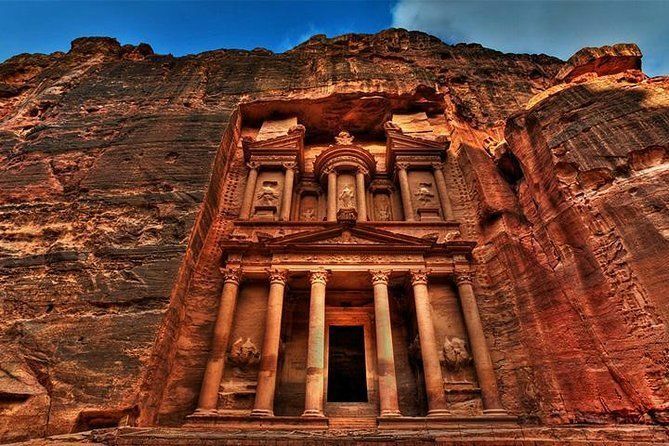 After that, you will be transferred by an air-conditioned vehicle for about 1.5 hours to the rose-red city of Petra. First started in the 6th century B.C. by Nabataean Arabs the city boasts beautiful facades carved directly into the walls of the mountainsides. Arriving at the visitor’s center it’s a 700-meter walk to the Siq entrance which is an impressive 1200 meter long gorge of a kaleidoscope of colors the towers more than 80 meters above you. As you exit the chasm you’re instantly transfixed by the beauty of Petra, chosen as one of the New World Wonders, the place speaks for itself. After your time at Petra, you make your way back through the Siq and head to lunch at a local restaurant. From there you take a one and half hour drive to the protectorate of Wadi Rum a sprawling desert landscape that impresses you at every turn. Made famous by the film Lawrence of Arabia, there are canyons and cliff, sand dunes and ancient rock glyphs. Finally, you will be driven back to the cruise in Aqaba.